We recently helped out our friends at Billabong Brewery with a gluten free recipe to pair with their GF Blonde beer. 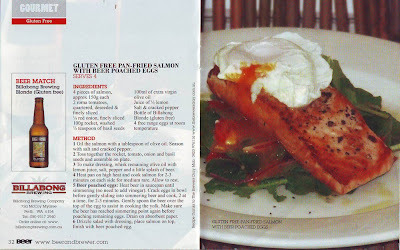 Here's the recipe as featured in the latest edition of Beer & Brewer Magazine in a snazzy Summer Cook Book lift out. Issue 11 Summer 09 is out now throughout Aus & NZ at all good newsagents & breweries. Buy it!